Free standing cliff facade modeled after the famous Colorado 'Palisades'. This ready-to-use mountain front is formed from polyurethane foam weighing only 2 pounds. Measure: 34" L x 18" H x 8" Deep. Hollow back cavity. *(ADDITIONAL SHIPPING SURCHAGES ADDED TO ORDERS). Designed as a 'filler' for that ever-present 'DEAD' corner in every layout! Measurements: 19½"L x 14½"W x 5¼"H.
Granite master casting. Suitable for all multi-scale applications. Excellent for steep mountain cuts and blasted rock cliffs. Measures approx. 6" H x 7" W x 1" thick. Limestone master casting. Multi-scale applications. Excellent for New England or Allegheny areas. Deep cracks and crevasses. Approximately 7"H x 6"W x 1" thick. Western shale master casting for all multi-scale applications. Modeled from Colorado 'Oil Shale' may be used for Eastern Allegheny or Pennsylvania models. Approximately 8"H x 6"W x 1" thick. Finely detailed volcanic basalt master casting for all multi-scale applications. Western Rockies, Sierras or New England. Approximately 6"H x 7"W x 1" thick. Pennsylvania Shale Cliff - A lightweight urethane foam composition that cuts effortlessly with simple tools. Preweathered in primer gray tones. Measurements: 13"w x 9"h x 1½" thick. Modeled after Eastern & Western shale samples. Made of hard urethane foam. Measures: 27½"L x 9½"H x 1¾" thick. CAR AND SCENERY ACCESSORIES SOLD SEPARATELY. Fine shale casting. Suitable for small and multi-scale applications. Excellent for all shale outcroppings. Measures approximately 4½"H x 8"W x 1" thick. Fine granite casting suitable for small and multi-scale applications. Excellent for steep mountain cuts and blasted rock cliffs. Measures approximately 5"H x 7"W x 1" thick. Large layered granite suitable for small and multi-scale applications. Excellent for all shale outcroppings. Measures approximately 5"H x 12"W x 1" thick. Pittsburgh Cut Ready Rock- Fine layered sandstone suitable for small and multi-scale applications. Excellent for all shale outcroppings. Approximately 4¾"H x 15"W x 1" thick. Fine granite casting suitable for small and multi-scale applications. Excellent for steep mountain cuts and blasted rock cliffs. Measures approximately 4¾"H x 10½"W x 1½" thick. Large layered limestone suitable for large and multi-scale applications. Excellent for all blasted outcroppings. Measures approximately 7½"H x 14"W x 1½" thick. Deep cracks and crevasses make this multi-scale rock an excellent choice for New England or Allegheny areas. Dolomite Granite measures approximately 13¼"L x 6¾"H x 1" thick. Deeply strata granite suitable for small and multi-scale applications. Excellent for all rugged outcroppings. Measures approximately 3½"H x 13"W x 1½" thick. 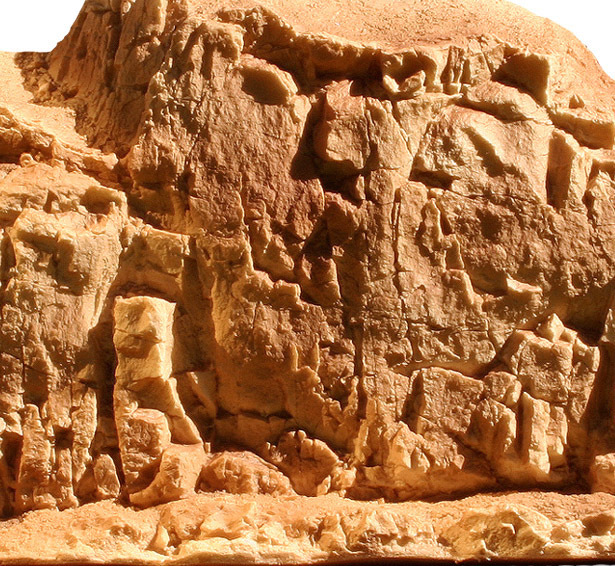 Reproductions of actual rock formations from around the U.S.A. as shown in railroading magazines across the states. Extra large layered limestone with weathered outcropping suitable for large and multi-scale applications. Excellent for all blasted outcroppings. Measures approximately 8"H x 16½"W x 1" thick. 'Pennsy' Single Stone Portal for 1:160 scale models. Sold in pairs. Lightweight and durable. Ideal for modular layouts. Measures: Top measures 2-3/4" wide by 2½" high by ½" thick. Inner Arch Dimensions: 1½" wide by 2" high. 'Pennsy' Double Stone Portal for 1:160 scale models. Sold in pairs. Measures: 4" wide by 2¾" high by ½" thick. Inner Arch Dimensions: 2¼" high by 2½" wide. 'Pennsy' Single Concrete Portal for 1:160 scale models. Sold in pairs. Lightweight and durable. Ideal for modular layouts. Measures: 3" wide by 3" high by ½" thick. Inner Arch Dimensions: 1½" wide by 2" high.